Canadian Craft Museum, Vancouver 1992. 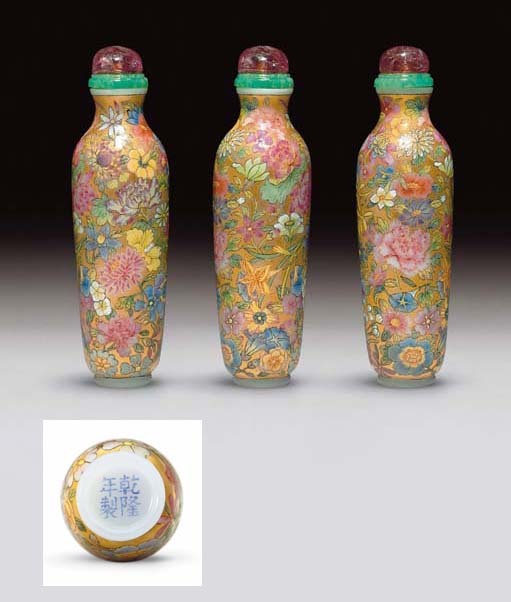 The earliest reference to an enameled glass snuff bottle is discussed in an article by Emily Byrne Curtis, "The Kangxi Emperor's Glasshouse... Nalla Fornace di Vetri", JICSBS, Winter 1990, p. 12, where her research into the Jesuit archive in Rome revealed records that the Kangxi Emperor gave his own enameled glass snuff bottle to De Tournon, an apostolic delegate from the Vatican in 1706. However, the manufacture of enameled glass wares was fraught with difficulty. Under the Yongzheng and Qianlong Emperors, for instance, the glass bottles would be designed on paper first by court artists and only after the Emperor had given his approval would they be produced. Because of the difficulty of successfully firing enamels on glass, the failure rate was apparently high in this art form, prompting the Qianlong Emperor to keep most of the enameled glass wares produced at the Palace, while distributing other art forms. The Imperial Archives of the Palace workshops indicate that perhaps as few as three hundred snuff bottles of enameled glass were successfully fired during the entire sixty-year reign of the Qianlong Emperor. Since smaller objects were easier to control than large ones, this dictated that the majority of Imperial enameled glass wares were small, such as snuff bottles, wine cups and brushpots, with snuff bottles far outnumbering other forms. The difficulty encountered in manufacturing enameled glasswares has, in the case of the present example, been compounded by its mille fleurs decoration. The attractive and complex design was difficult to execute, as the artist had to ensure that the flowers had to be relatively proportionate both to the size of the vessel as well as to one another. A tour de force of the decorator's art, such a bottle would have been extremely time-consuming to produce, and required a painter of exceptional skill. See an enameled double-gourd glass snuff bottle, illustrated by R. Kleiner, Chinese Snuff Bottles. The White Wings Collection, pp. 16-7, no. 9, delicately painted with double-gourds and flowers against a gold ground. Amongst the flowers depicted on this bottle, the artist has rendered in great detail peonies of several kinds, lotus, chrysanthemum, magnolia, roses, hibiscus, lilies, asters, begonia, narcissus, morning glory (convolvulus), cymbidium orchids, camellia, dianthus, jasmine and many others. The sumptuous Qianlong mille fleurs design was much admired by later generations, as can be seen on an enameled porcelain double-gourd snuff bottle from the collection of Mr. and Mrs. A. Stempel, illustrated by B. Stevens, The Collector's Book of Chinese Snuff Bottles, no. 300, and from the Jiaqing-marked vase in the Shanghai Museum, illustrated in Qingdai ciqi hangjian, Shanghai, 1994, p. 196, no. 251. Even Yuan Shikai (1859-1916) was so impressed by such porcelains that he had a small box and cover, now in the Percival David Foundation, made in this style with the mark Juren Tang zhi (made for the Hall of Dwelling in Benevolence). This box and cover illustrated by M. Wilson in Rare Marks on Chinese Ceramics, London, 1998, pp. 44-45, no. 12, must have been made after 1912 when Yuan Shikai moved into one of the palaces of the Forbidden City and named it Juren Tang. While charming, these later examples never reached the superb standard of design and execution seen on exquisite Qianlong pieces such as the present lot.